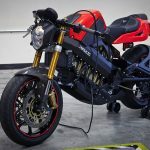 The Victory prototype electric TT motorcycle was recovered Sunday with damaged bodywork and the rear wheel removed, but largely complete. 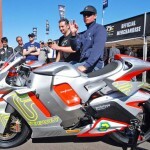 The electric race bike that Irishman Lee Johnston rode to the podium in the Isle of Man/SES TT Zero race was returned to Brammo Headquarters in Talent, OR. “Everyone at Brammo are relieved to have bike #3 back in the stable and are extremely grateful to the City of Talent Police Department for working diligently to solve this case. We’ll need some time to fully assess any damage done, but from initial inspection it appears mostly cosmetic and repairable. What a bizarre event this has been. Thank you to everyone that shared the story and participated indirectly in the recovery,” says Brian Wismann, Brammo’s Director of Product Development. 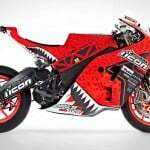 Talent police were able to get information on the bikes whereabouts late Sunday afternoon. A warrant was served for a rental residence ending in the custody of two individuals. 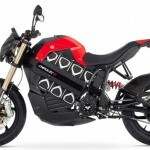 The main suspect, who has a long history of run-ins with law enforcement, told police he intended to disassemble the bike and sell the parts, though nobody has admitted actually breaking into the Brammo headquarters where the race bike was on proud display. 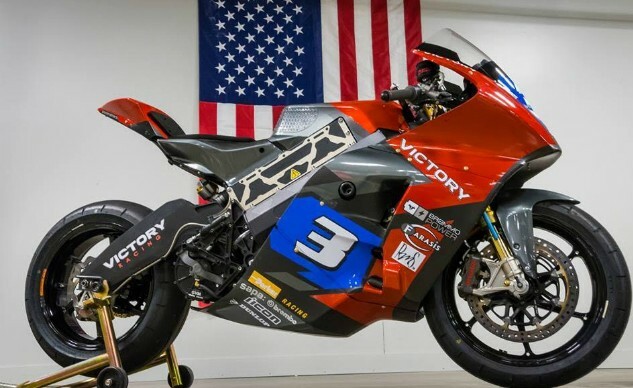 The employees of Victory Motorcycles and Brammo wish to thank all of those who shared the news of the theft of this valuable piece of racing history. The sharing of this news through social media would have made it almost impossible for the transportation or sale of the motorcycle to have gone un-noticed. It’s another example of the motorcycle community watching out for each other.